When I started seeing my nutritionist, one of the first things she told me was that I wasn’t drinking enough water. The problem: I hate water! But since I knew she was right of course, I just started using a little trick: infused waters! I make cucumber water; I make watermelon water; I put lime, lemon and mint in my water; I put stevia in my water; I put agave in there—you name it, I’ve made flavored water with it! To keep things easy, I make the infused waters ahead of time and just keep pitchers full in my fridge. The best part is that when guests come over they think I’m just the hostess with the mostess with my fancy H2O… little do they know I just hate plain water! 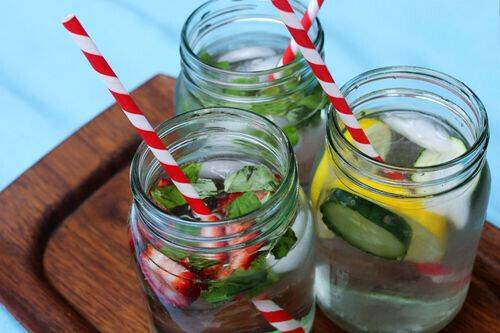 Have you ever tried infusing your water? What’s your favorite thing to put in it? 5 Tips To Feel Well-Rested (Even If You're A Mom)! 5 Tips To Feel Well-Rested (Even If You're A Mom)!I never knew the true definition of exhaustion until I became a mom. Here are some tips and tricks I've learned to help myself look and feel more well-rested.